Beaumont Place is a vibrant new development set within the beautiful countryside of the South Downs National Park, a glorious open space with beautiful greenery all around. This new community that is currently taking shape is well located within close proximity of the bustling market town of Petersfield which is surrounded by beautiful countryside. This development has been planned to meet the needs of across-section of society from London city commuters who can easily access Petersfield Train station, to growing young families who are looking to raise their children in a beautiful rural location with excellent schooling and local amenities nearby. With Petersfield being voted one of the UKs top market towns our new homes sit within an excellent community in a fantastic location. This community has been designed and is well situated to enhance the quality of life for its new residents. With excellent transport links and close proximity to the Town Centre, Beaumont Place residents have the option of travelling into London or staying local and enjoying the beautiful town centre. Petersfield town has a lot to offer, from retail shops, bars and restaurants to leisure activities and sports. So, if you're looking for that countryside living, with great transport links at your door and local amenities nearby, your search ends here! It is just a mile to Petersfield town centre which is bursting with shops, offering everything from food and fashion, to crafts, gifts and books. Folly Market is an indoor treasure trove of retailers, while the Market Square hosts twice-weekly markets and monthly Farmer's Markets. For supermarket shopping choose from M&S Simply Food, Waitrose, Lidl and a Tesco superstore. For city sprees, visit Portsmouth, just 17 miles away with its Cascades Shopping Centre and Gunwharf Quays retail outlet boating more than 90 stores. The Boardwalk at Port Solent is a contemporary waterside destination. At historic Winchester, 21 miles away, you'll find leading brands alongside smaller shops selling vintage goods, antiques, art and collectibles. The South Downs National Park offers an abundance of excellent walking routes including the 100-mile, South Downs Way. The area is also popular for cycling and mountain biking, with the 22-mile East Hampshire cycle route being one of many. Picnic beside the 22-acre pond at Petersfield Heath, or climb Buster Hill, the Downs' highest point in Queen Elizabeth Country Park. You can also enjoy Petersfield's many festivals and fairs see live performances at The Festival Hall, or watch a film at its New Savoy Cinema. Visit the Physic Garden in the town centre or take a summer dip in the heated pool! For indoor swimming, gym, fitness and sports there is the Taro Leisure Centre. There are playgrounds and re-school groups as well as an infant, junior and senior school in Petersfield, all within easy reach of Beaumont Place. Petersfield Infant School caters for 5 to 7-year olds, and Herne Junior School takes pupils aged from 7 to 11 years. Petersfield School is the town's mixed, Secondary School for students aged between 11 to 16 years. The independent Churcher's College caters for nursery, junior, senior and sixth form students. In nearby Steep, Bedales School is a mixed boarding and day school for children and students aged from 3 to 18 years. At Beaumont Place, Petersfield we are putting £980,300 towards schemes and projects to support the local community and we will continue to work closely with the council to deliver these improvements. Recently announced as one of the top places to live in the country, Petersfield has a lot to offer its residents, with shops and markets, walks and restaurants, museums and a theatre. 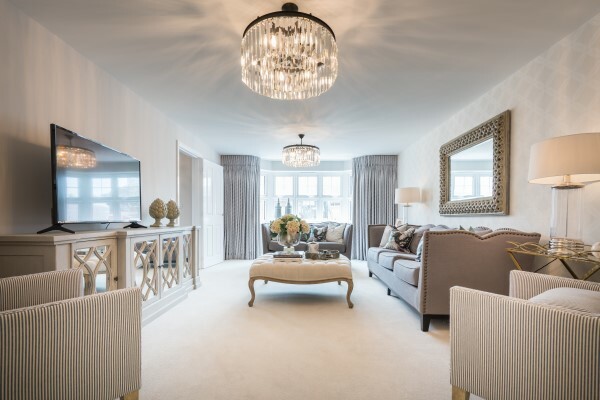 St Patrick's Day will be house hunting day in Hampshire, as Bovis Homes launches a highly-anticipated new part of the Petersfield community.